MMS MAY 2018 64 mmsonline.com MACHINING CENTERS | Doosan Machine Tools America 973-618-2500 | doosanmachinetools.com Potential discrepancies in the relative posi- tions of the workpieces in X and Y have to be addressed, and he sees at least two possibilities here. One is to machine the two fixtures for the two parts simultaneously with the tandem spindles. The fixtures will therefore naturally locate accurately to the spindles. However, more commonly, he says, "The high-volume plants interested in this machine tend to use high-end fixture builders who have no issue creating suit- able production fixtures for this machine." One feature of such a fixture might be adjustment screws capable of fine-tuning the X and Y posi- tions of one workpiece relative to the other. Doosan's very first user of the two-spindle machine was a high-volume manufacturer fitting this description. 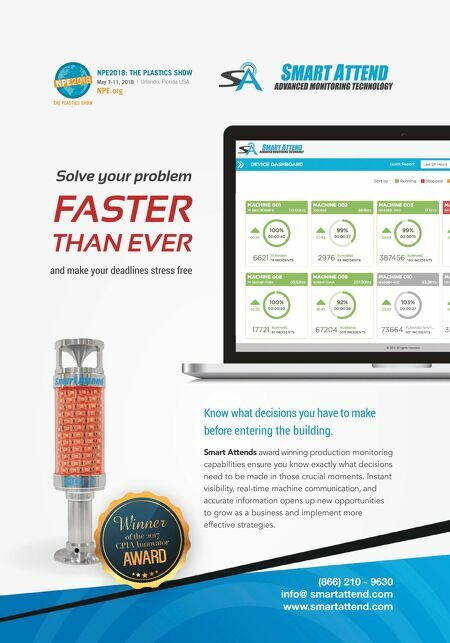 Doosan designed the two-spindle DMP machine with this user in mind after the company came to the builder with its problem. The production demand this plant faced for a new set of parts would have required 66 VMCs—too many for the maximum potential space the plant had available. Instead, the manufacturer asked for a machine with two spindles. Doosan's development of this solution enabled the company to buy only 33 machines instead. (It has since installed more of them for other part numbers.) William Carr is Doosan's director of key accounts and engineered applications. He was involved in the project with this large manufac- turer and has been involved in other applications of the two-spindle machine. He says there are some important nuances to using a machine such as this effectively—considerations that go beyond coordinating the two parts with two spin- dles. One is the care needed when using more than four axes. Rotary tables can be effective with this machine type, but a rotary table with two rotary axes introduces further X-Y variation to a setup that is more complex than that of a typical machining center. For the parts produced on the 33 machines in the initial installation, angled holes are added to the parts using a dual- axis rotary table on a single-spindle VMC. He says another important factor to consider relates to the potential for high productivity and the role the operator must play in realizing this. "When the machine door opens, the operator has to be right there," he says, unloading the two finished pieces and loading two new ones. The initial high-volume user of this machine happens to excel at this; the company has a disciplined team of operators attending the two-spindle machines. However, not every facility is like this. 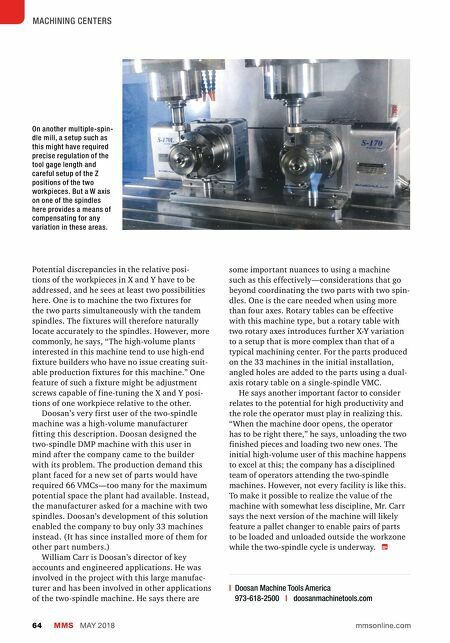 To make it possible to realize the value of the machine with somewhat less discipline, Mr. Carr says the next version of the machine will likely feature a pallet changer to enable pairs of parts to be loaded and unloaded outside the workzone while the two-spindle cycle is underway. On another multiple-spin- dle mill, a setup such as this might have required precise regulation of the tool gage length and careful setup of the Z positions of the two workpieces. But a W axis on one of the spindles here provides a means of compensating for any variation in these areas.